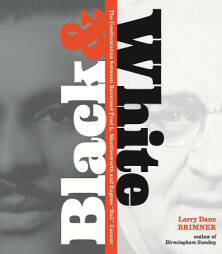 I just finished reading my friend Larry Dane Brimner’s latest book BLACK & WHITE, THE CONFRONTATION BETWEEN REVEREND FRED L. SHUTTLESWORTH AND EUGENE “BULL” CONNOR. 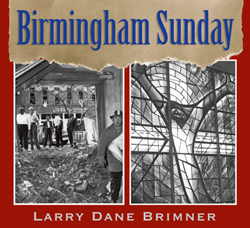 This book fits in with two of Larry’s previous works; WE ARE ONE and BIRMINGHAM SUNDAY. The trio takes us through the pivotal events of the Civil Rights Movement and it’s epicenter, Birmingham Alabama. These books are written for kids who are researching and writing papers about the Civil Rights Movement and it’s key players, but I challenge anyone-adults I’m pointing at you-to pick these books up and then put them back down again without reading every page. Without examining every photo. Without reading each sidebar and image caption. Yes, it’s history and you’ve already heard all about the civil rights fights of the ‘50s/’60s, but you haven’t really seen anything until you look through the lens of Larry’s eyes at the subject. 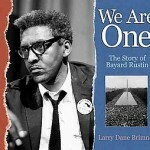 In WE ARE ONE, we meet Bayard Rustin-advisor to the now legendary Dr. Martin Luther King. Bayard instructed Dr. King in the peaceful resistance techniques that his grandmother taught him. It was Rustin’s beliefs that guided Dr. King in the attitude that would part the sea of hatred. 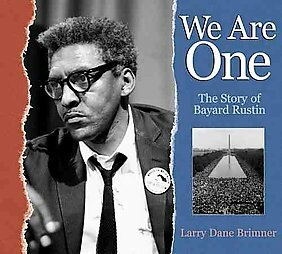 Like the greatest of heroes, Bayard faded into the background when it looked as though he might be used to overshadow Dr. King and the issue of Civil Rights. You see, Bayard was also homosexual which was possibly the only worse thing to be than being black back at that time. But I believe that Bayard’s work has now carried forward in spirit to help in today’s fight for gay civil rights. 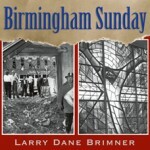 Larry’s next book BIRMINGHAM SUNDAY takes us to the church in Birmingham on that horrible day a bomb went off killing four little girls, and in the aftermath-two young boys. Larry introduces us to each child and makes it clear that these were everyone’s children. We get to know these six children so that we can feel the pain and the senselessness of the loss of their precious lives. Those were our daughters and sons taken in the hot destructive path of hate that blindly cut through the church in Birmingham. The beautiful writing and the tender care that Larry lends to the narrative will touch all readers and change them for the better. 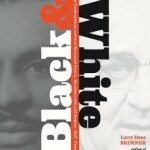 Reading BLACK & WHITE, Larry introduces us to Reverend Fred L. Shuttlesworth first and then to his nemesis Eugene “Bull” Connor. The third part of the book is the confrontation between these two powerful human forces. If not for the hate that Bull Connor refused to give up, these two men could’ve been cut from the same cloth. I appreciate how Larry let’s us know both men who were passionate, charismatic and dynamic. A true story of good and evil and the parallels they draw. As I read I was also struck by the deluge of conflicts and discouragements that Rev. Shuttlesworth not only dealt with, but overcame. Any one of which most people would have turned tail and fled far and fast from. I am left inspired and encouraged. As a kid, I had learned about the civil rights movement in facts and dates and names that blurred together. Reading these books cleared so much up for me as Larry walked me through page by page, painting upon the pages each detail in vivid color for me to study. As we all know, things are never simply black and white. Larry made me feel like I got to know the people and their motives. I could see the individual situations instead of just a mashup of historical events labeled “civil rights.” I am privileged for being given the opportunity to feel like being an insider to events that happened before I was born……if only by a few years. It’s important that these facts are preserved in such great detail. They inform the history that’s being made today. I would like to think that these men and woman who fought their own communities so hard for the rights they should have been freely given would be proud of today’s protestors who are occupying Wall Street. They’re employing many of the same peaceful approaches to getting their voices heard. It is also good to be reminded that this is all recent history. Many of the people who fought this fight are still alive. Rev. Shuttlesworth just passed away a couple of weeks ago, three days before BLACK & WHITE was launched. My father also reminded me of how close in time this all happened. As he told me a story about his father, which is unrelated to these books. My father told me of his father advising him to not use the outhouse marked for “colored” only or he would be beaten. I was also told of how my grandfather offered a simple kindness to a black man that would’ve gotten him beaten if he was caught changing the bloody newspaper the dying black man was laid upon. The fact the man, who was being eaten by cancer, was left on newspaper to die is intolerable, but it has to be taken in the context of the time. And I was happy to hear that my grandfather was kind enough to risk being beaten in order to offer a simple kindness. I am the Dance Master! Escorted down our 400ft driveway. Blue whales, white sharks and the subliminality of picture books. Writing for boys and gaming. Aunt Maryann is selling Mary Kay Cosmetics! Copyright © 2010  2011 Angela L. Fox. All Rights Reserved.